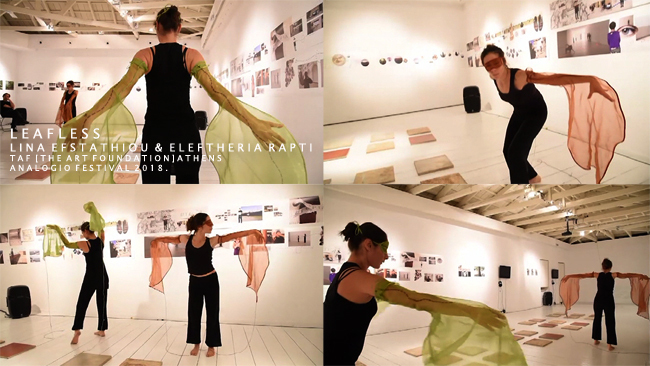 [Leafless I & II] A sound composition [Maya Dalinsky [USA/B] Dancing Leafless II] and [Anastasia McCammon dancing Leafless I] at the Dancehouse Lefkosia during the Urban Emptiness Nicosia Festival 2017 in Cyprus. Stefaan van Biesen. Sound Composition for art installation 'Fly Ways' 2012-2016 ['Wanderlust' Art borgloon, 'Passages' La Romieu France 2016, 'Fly Ways' Santorini Art Factory Greece 2016. Composed, mixed and produced by Stefaan van Biesen. É T U D E S F O R 2 E L E C T R I C G U I T A R S [ 2 0 0 9 ] . [Études for 2 electric guitars]. Electronica +2 treated guitars and keyboards. A mix of improvisation, self made samples and home computer production. [Peter Maes & Stefaan van Biesen]. [Stefaan van Biesen/Fading Photographs]. Compositions of field recordings in Europe, composed, mixed and produced by Stefaan van Biesen. Electro and classical instruments. [Stefaan van Biesen/Fading Photographs]. Compositions of field recordings in Europe, composed,mixed and produced by Stefaan van Biesen. Electro and field and radio recordings. [The Dresden Suite] Live at DACCA Belgium. Composed, mixed and produced by Stefaan van Biesen. Electro and field and radio recordings. A live performance by 2 guitar players: Peter Maes & Stefaan van Biesen. T H E L I S T E N I N G C I T Y : a live sound collaboration. The Listening City - [Peter Maes & Stefaan van Biesen]- Live at STeM Sint-Niklaas Belgium 2013. [A Knocking Bird] Sint-Niklaas Belgium. [A Balkan Tale] a travelling sound project commisioned by the Goethe Institute Athens Greece 2011.
the Milena principle, Geert Vermeire and Stefaan van Biesen collaborated with soundartist Enrique Tomás [Escoitar.org] on various projects that connect literature, visual arts and new media. Including geolocalization, movement technology, applications for portable screens [smartphone, gps] for among others SMAK City Museum of Contemporary Art Ghent in Belgium, and a travelling project for various cultural venues in five countries [City Museum of Belgrado, Museum Kunstsammlungen Chemnitz, Museum Deichtorhallen in Hamburg in 2012, and in the Historical Museum of Trieste in 2013]. [A walk with Kazantzakis] the Analogio Festival 2017 Athens Greece 16.09 > 24.09.2017. A sound walk with Kazantzakis, inspired by imaginary and real travels as described in one of his last novels “Report to Greco”. Disarmingly personal and intensely philosophical, Report to Greco is a fictionalized account Nikos Kazantzakis’s own life, a sort of intellectual autobiography that leads readers through his wide-ranging observations on everything from the Hegelian dialectic to the nature of human existence, all framed as a report to the Spanish Renaissance painter El Greco. The assuredness of Kazantzakis’s prose and the nimbleness of his thinking as he grapples with life’s essential questions—who are we, and how should we be in the world?—will inspire awe and more than a little reflection from readers seeking to answer these questions for themselves. The opening walk on September 18th will be accompanied by four actors performing texts of Report to Greco at the points of interest of this sound walk complementing the soundscape. Soundwalk design and musical scenario: Geert Vermeire. Performative walk directed by: Sissy Papathanissiou. Actors: Larissa Vergou, Panagiotis Lezes, Christina Hilla Fameli, Charis Symeonidou. Commissioned by the Analogio Festival 2017 – Athens. Production by the Milena principle / Analogio Festival. Sound compositions for theater play, directed by Sissy Papathanassiou, Athens Greece 2016. Composed, mixed and produced by Stefaan van Biesen/the Milena principle 2016. [Blind Walk / White Walk] Athens Greece 2016. 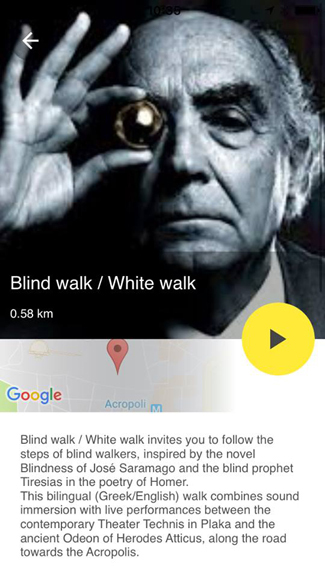 Blind walk / White walk invites you to follow the steps of blind walkers, inspired by the novel Blindness of José Saramago and the blind prophet Tiresias in the poetry of Homer. This bilingual (Greek/English) walk combines sound immersion with live performances between the contemporary Theater Technis in Plaka and the ancient Odeon of Herodes Atticus, along the road towards the Acropolis. Actors: Jenny Dagla, Polyxeni Thanou, Charis Symeonidou, Yiannis Tsaparegas, Nikolaos Georges Chaldeakis. Sound walk / field recordings: Geert Vermeire. Compositions: Stefaan van Biesen. English texts read by Rosa Prodromou. Blind Walk/White walk Homer and Saramago is a concept by Simona Vermeire and Sissy Papathanassiou. A collaboration between the Milena principle and AnalogioGR. A production by the Analogio Festival 2016. With the institutional support of the José Saramago Foundation, Lisbon. Live performance, Sunday October, 2nd at 12 am. Soundwalk made with / available on Echoes.xyz in PlayStore and AppleStore. Free download.